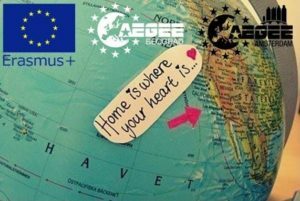 Last December, AEGEE-Amsterdam and AEGEE-Beograd organised the event “Home is where the Heart is – Erasmus+ exchange 2017”. For this reason, they were chosen as the ACTive Local of the Month. We spoke to Amy Treuren, European Affairs Officer of AEGEE-Amsterdam, and Isidora Braljinac, President of AEGEE-Beograd, to find out more! ACT: Which emotions did you have when you discovered that your local was chosen as ACTive Local of December? Amy Treuren, AEGEE-Amsterdam: We were of course really happy to hear this amazing news! Thanks a lot! We were also very surprised because we absolutely did not expect to become ACTive Local of the Month. 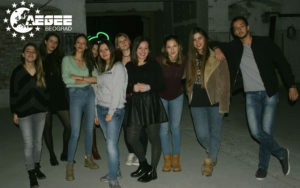 Isidora/AEGEE-Beograd: We said: “Finally!”, but it is not like we expected it. Anyhow, very grateful and happy. Could you tell us little bit more about your event? 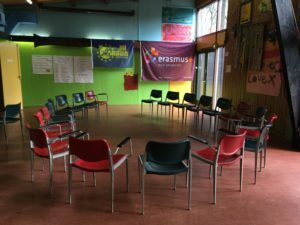 (Home is where the Heart is – Erasmus+ exchange 2017). How many participants did you have, who applied, programme, goal, etc. Amy: The goal of the event was to make the participants get in contact with another culture and country and learn about it, to learn about their own culture and country and what this means for themselves and for others. We also wanted to remove prejudices and stereotyping, create intercultural dialogue and create awareness about and stimulate European values. The participants developed different kind of skills, like organisational skills, working in a team, language skills, open-mindedness, confidence etc. We had 20 participants in total, 12 from AEGEE-Beograd and 8 from AEGEE-Amsterdam. Both groups already made a short movie in which every participant and group leader introduces themselves for the other group. During the programme we got to know each others’ culture and country. We did a boat trip, went to a museum, visited the participants’ parents, met and played soccer with refugees, did street interviews, had a European Night. The programme was very varied. The Erasmus+ exchange was co-funded by the Erasmus+ programme of the European Union. Why did you decide to apply for grant and organise that event? Amy: Our local applies every year for an Erasmus+ grant. Most of the times our application gets rejected, like the 3 years before. So it was quite a surprise for us that our application got accepted. 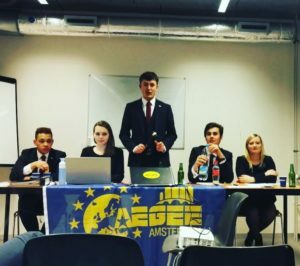 Isidora: We wanted to try something different and when AEGEE-Amsterdam asked us if we want to be their partner – that was it. Could you tell us all steps you did to apply for grant? Did you have any problems? Amy Treuren: Last year Iris van den Oord, our previous European Affairs Responsibe, applied for the grant. Unfortunately there were too many applications and this one got rejected. We received feedback on the application. We received the advice not to apply for the deadline of the 4th of October, because the chance that the application would be accepted was really small. They only had a small part of the budget left. We decided to still do it and to improve the application of the previous year, this time with extra feedback. I went to a training in Spain to learn about Erasmus+ and how to write an application. I learnt a lot there and this is the result! Close before the deadline our previous partner for the project did not reply anymore and we had to look for another partner. 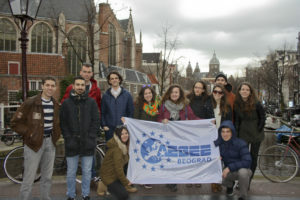 Luckily we found AEGEE-Beograd and they are a great partner. Amy: We tell our new members during the introductory period about the Action Agenda and Strategic Plan. Only this is very short, because there is not enough attention for this by our members (unfortunately). Sometimes we share things on our Facebook page so people who are interested can read it. And also we send a European Newsletter to our members every month. Our members can also read about it on our website. Isidora: We always do a short introduction about it to every new member, from time to time discuss it at our meetings and encourage them to ask us about everything that is not clear to them. Do you have any activities related to the Action Agenda/Strategic Plan? Amy: Every year we organise new ones. Last summer our Summer University was related to the focus area Civic Education. Our Cultural Committee organises a couple of lectures every year, with sometimes themes related to the Action Agenda, like gender equality. Isidora: This year we are cooperating with ACT for our Summer University and we are planning an LTC. Last year we organised a NWM, which included multiple topics related to the Action Agenda and Strategic Plan. Also, there are many other small things in other events we organise. AEGEE is fun, but it also has its powerful side! Think about what you would like to organise and about what your members are interested in. Do not think too difficult and be creative. AEGEE-Amsterdam was founded on 26th of March 1986. Since then it has grown to become the biggest AEGEE local with around 550 members, 200 are of them active. We have around 24 committees varying from a party committee to a cultural committee and from a European committee to a social drink committee. There are too many to name them all. Every Tuesday we have our social drink, every week we have activities and we have a couple of trips throughout the year, like two hitchhiking trips, a skiing trip, exchanges, a European members’ weekend and many more. We organise many local activities during the year. We are always happy to welcome you and show you around in Amsterdam so do not hesitate to contact us! 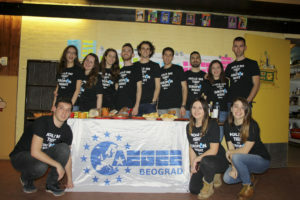 AEGEE-Beograd was founded on the 12th of November 1995. Right now we have 70 members including around 20 active members with FR and PR teams. We are a mostly girls’ antenna and we tend to show that girls can manage to do anything they want. We are all good friends, which makes us an even better team. Come to Belgrade, meet us, you will not regret it! 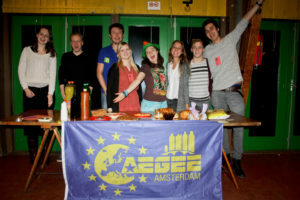 AEGEE-Amsterdam: Breaking borders with AEGEE-Amsterdam at local and European level with the help of parties, activities and trips. AEGEE-Beograd: The best things are in small packages. ← AEGEE Contact in Nicosia is Here to Stay!